Expo 2015 is the Universal Exposition that will be hosted by Milan, from May 1st to October 31st 2015. Universal Expositions are regulated and supervised by the Bureau International des Expositions (BIE) and take place every five years, lasting six months. The BIE is a private intergovernmental organization based in Paris and established in 1928 by the Convention Relating to International Exhibitions. The theme of Expo Milano 2015 is “Feeding the Planet, Energy for Life”, related to agriculture and nutrition. In 2006 the Italian government presented the candidacy of Milan to the BIE for the Expo 2015. In 2008 the Italian city was selected for the universal exposition and the national government started the official procedure for the new installation. The Expo 2015 SpA was created to organize and manage the event (constituted by the Italian government, the Municipality and Province of Milan, the Lombardy Region and the Milan Chamber of Commerce). 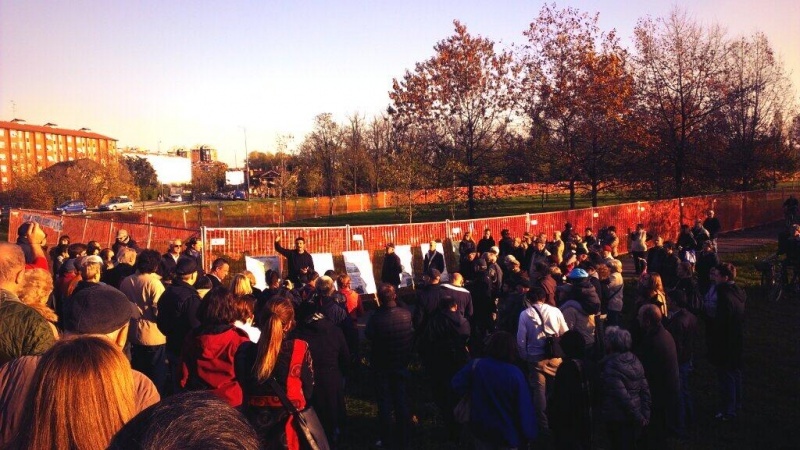 In 2007 the NO Expo committee was formed, a network of associations, social movements and civil society groups against the candidacy of Milan for Expo 2015, convinced that the event will not be an opportunity, but a disaster for the local environment, for the common good and for the national public purse. The area that will be occupied by the Expo 2015 site is located northwest of Milan in a former agricultural land of 1 million m². The public society Arexpo SpA was created to buy lands, owned by private interests, and paid 164€/m2 instead of 14€/m2, the real value. After Expo2015, the installations will be partially dismantled and Arexpo SpA will sell the area through a call for tender for new constructions. The initial Expo plan selected by the BIE, proposed the creation of a global garden equally divided between participant nations in order to maintain the agricultural origin of the area and to recreate the typical “food cycle” of each country. In 2011 Expo SpA decided to abandon this plan in favour of the classical twentieth-century model of national pavilions that will be demolished at the end of the event. In 2013, in order to respect definitive plan and schedule, the Government nominated the CEO of Expo 2015 S.p.A. as the sole Commissioner responsible for activating all means possible to complete the Project – through Powers of Derogation. The No Expo Committee denounces not only the social, economic and environmental impacts of major projects, but also the lack of transparency, the corruption and the speculation behind contracts, procurements and profits derived from it. During the construction of Expo 82 norms of the Public Procurement Code have not been complied (according to an investigation made by the Authority for the Supervision of Public Contracts), over 60% of contracts were awarded through private negotiation and over 500million € of public procurement have not been checked by the Regulatory Authority. Kickbacks were paid for the construction of the Expo and there are several ongoing investigations by the Judiciary. In addition, several companies have been pushed out from construction sites for relationships with mafia. Another contested issue is the employment uncertainty of the Expo system who will recruit 18,500 unpaid volunteers. Contracted workers will be around 800, at fixed term, without guarantees of keeping these places of work post-Expo. The biggest mobilization within the Expo conflict concerns the Waterways project. The canals planned to bring the water used for the Expo installations to the existing canals of Milan that could provoke a radical change of three public parks. Local citizens protested against the destruction of the urban parks and in early 2014 obtained the suspension of works and the revision of the Waterways project. In May 2014 judiciary investigations led to the arrest the Expo SpA general manager and other people for alleged corruption and bid-rigging connected with Expo 2015. Development of Alternatives In 2010 the Politecnico of Milano proposed another project called "Expo widespread and sustainable" http://www.eds.dpa.polimi.it/web/guest/obiettivi-del-progetto. The main idea of the project was to promote a decentralized event throughout the region through sustainable interventions at local and regional level. Why? Explain briefly. The Expo 2015 project was not stopped and the alternative proposals were not taken into account. However, the mobilization against the destruction of the three parks to create a new canal was able to block the Waterways project, which is currently under revision.